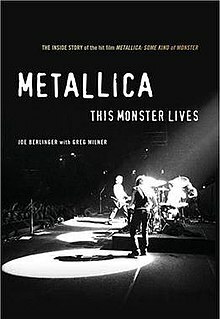 Metallica: This Monster Lives is a book written by Joe Berlinger and Greg Milner about how Berlinger filmed the feature-length movie Some Kind of Monster with the legendary heavy metal band Metallica. The book follows the emotional roller-coaster both he and his film partner Bruce Sinofsky and the band Metallica went through during the creation film. The book takes in the time from Berlinger and Sinofsky's first meeting with Metallica in 1999 to the 2003 Summer Sanitarium Tour. Berlinger and Sinofsky's relationship was at an all time low, exacerbated by Berlinger's decision to direct the disastrous sequel to the Blair Witch. At the start of filming the relationship between the band members, especially between vocalist James Hetfield and drummer Lars Ulrich, is in a similarly perilous position after bassist Jason Newsted quit the band and long standing grudges between the remaining members threaten to escalate past the point of no return. It also follows the creative side of the film, after amassing over 1,600 hours of footage for what was originally supposed to be a short promo for the band's new album the film's editing team had to rapidly change plans as the footage changed from the promo to a TV series and eventually to a feature film. The book's title is reference to a line in the band's song "Some Kind of Monster" which the film was named after.